Devoid Of Culture And Indifferent To The Arts: You say turnip, I say rutabaga. And a recipe. You say turnip, I say rutabaga. And a recipe. Some homestyle recipes just can't be beat. It seems simple enough. You go to the grocery store, mindlessly wander to the section that has the squash, cabbage and root vegetables and pick up a turnip for dinner. Wrong. What you have in your hand probably isn't a turnip. It's most likely a rutabaga. Now before you start saying “you say po-tay-to and I say po-taa-to” there actually is a difference. It may be subtle, but it’s true. And there’s no shame in being confused. Both rutabagas and turnips are called by each others names. Quite commonly in fact. The turnip or white turnip is a root vegetable with a swollen, smooth taproot. 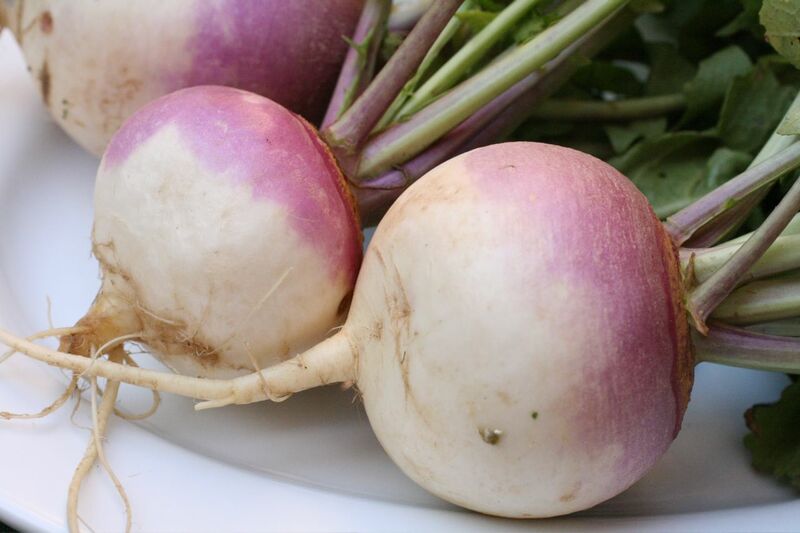 In the UK the turnip is also called a "neep." Just for confusion, “neep” often also is used as the name for the larger, yellow rutabaga. Turnips have been used as food for a very long time. There is evidence that the turnip was domesticated before 1,500 BC. It is known to have been grown in India at that time for its oily seeds. The turnip was used in Greek and Roman times as well. 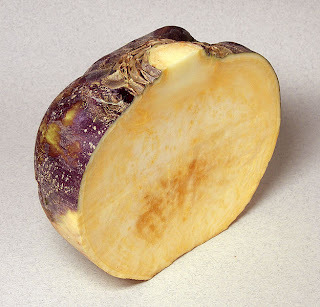 The rutabaga (also known as swede, turnip or yellow turnip – see the confusion?) is a root vegetable that originated as a natural cross between cabbage and turnip. Its common name in Sweden is kålrot (the translation meaning "cabbage root"). The first known reference to the rutabaga comes in 1620, from the Swiss botanist Gaspard Bauhin, where he wrote that he found it growing wild in Sweden. It is often assumed to have originated from Scandinavia or Russia. Both turnips and rutabagas are from the family brassica, which also includes cabbage, cauliflower, broccoli and Brussels sprouts. Both turnip and rutabagas are great additions to your diet. Like white turnip, the roots are eaten in a variety of ways, and its leaves can also be eaten as a leaf vegetable. The greens of both are highly nutritious and should never be thrown away. They are quite common in boiled dinners in both Canada and the United States. Most often turnips are used in homey, rustic dishes. But not everyone embraces the lowly turnip/neep/rutabaga/whatever you call it. In Europe rutabagas (and turnips) were considered a food of last resort, because of an over-use necessary during World War 1. They now are often associated with being destitute. 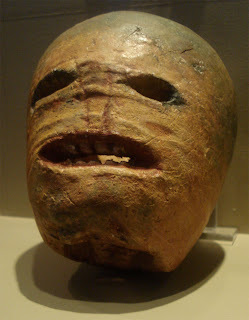 People from Ireland and Scotland have long carved rutabagas to ward off evil spirits. Apparently up until the 1980s rutabagas were commonly used at Halloween for candle holders – the same way we do in North America with pumpkins. After the 1980s they were readily available as imports from Europe. Why it took until just 30 years ago for pumpkins to be traded there in number is beyond me. If it's wrong, blame it on Wikipedia. There’s a real creepy picture of a carved rutabaga at right. It makes me think of a horror movie poster. choose has some fat through the meat. Heat the oil and butter in a large pot with a good fitting lid, like a Dutch oven. Add the beef, sprinkle with salt and pepper, and brown on both sides. 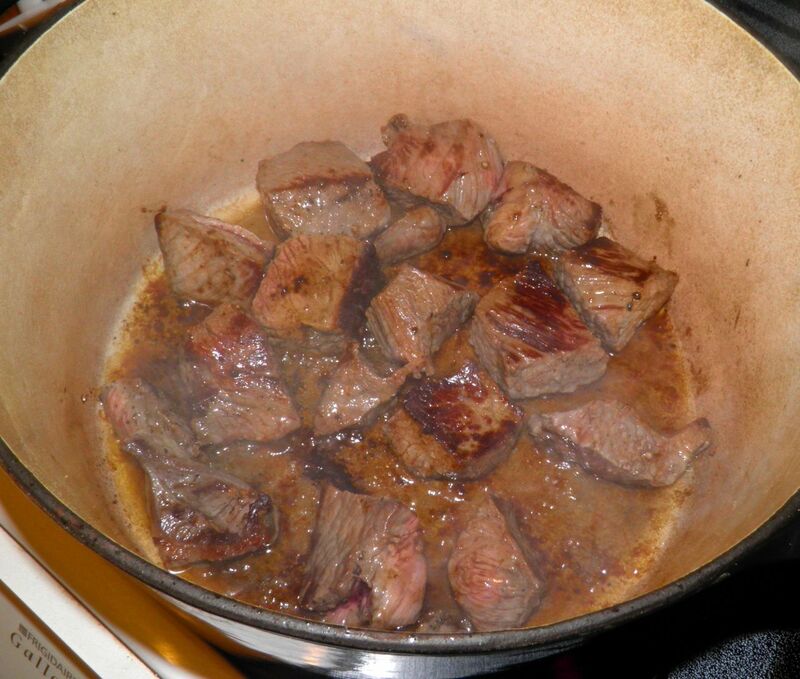 Do the beef in batches so the pieces aren’t crowded. If you do they will steam and not brown. Chop up the vegetables while the beef browns. Try to get them all relatively the same size so they all cook in the same length of time. Remove the browned beef from the pan to a plate. Add the onion and sauté until it begins to soften. Add a little water to the pan and scrape to loosen the fond. This is where your flavour will come from in the finished broth. After the onions have begun to soften add the beef and vegetables. Add enough water to just be seen under the vegetables. Don’t drown them. See the picture for how much water to use. Stir in some salt and lots of cracked black pepper. Bring to a boil, reduce heat to medium, cover and let cook for 15 minutes. Meanwhile mix together the dumpling ingredients. molasses dripping down over them into the stew. While the stew is cooking, melt the butter. Whisk the egg with the milk and then beat in the melted butter. Mix together the dry ingredients and them mix into the liquids. Combine just until there is no more dry flour showing. Do not over mix. 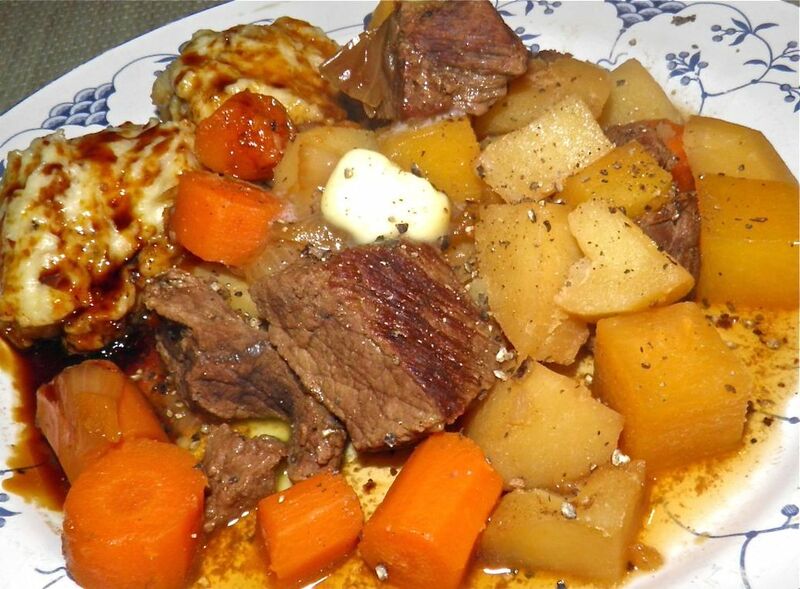 At the end of the first 15 minutes, drop measures of about 1/4 cup of dumpling batter on the surface of the stew. Make sure the dumplings do not touch. You should get 8 dumplings. 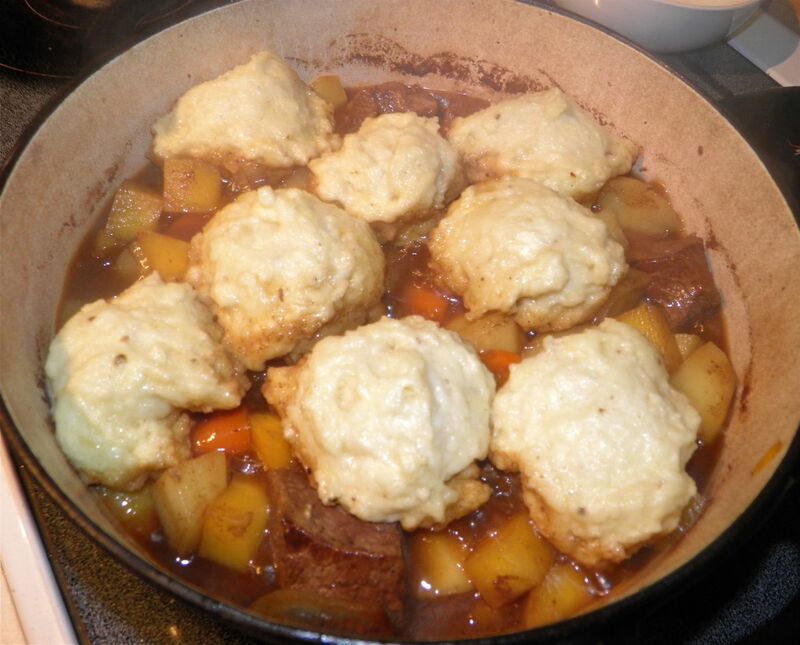 Immediately cover the pot and let the stew and dumplings cook for a further 15 minutes. How To: Open a Wine Bottle without a Corkscrew! Huh? Day-Old Fresh Bread, With Fruit! A little late, but I’ve turned Two!